Enjoy Clover Farms milk the old-fashioned way – refreshing and full of flavor. Pour a cold glass today and taste the difference! Clover Farms Vitamin D / Whole Milk has a very creamy and rich flavor and is loaded with essential vitamins and minerals. Did You Know? Milk is considered a “whole food.” It is naturally packed with calcium, Vitamin A, Vitamin D, Vitamin B12, potassium, phosphorus, riboflavin and niacin, and is the perfect blend of carbohydrates and protein. One 8-ounce glass contains almost 30 percent of the daily calcium requirement for adults. Calcium is essential for muscles, heart, bones, teeth, and a healthy nervous system, but it takes an adequate amount of Vitamin D or protein for the body to absorb it, both of which are contained in dairy products. 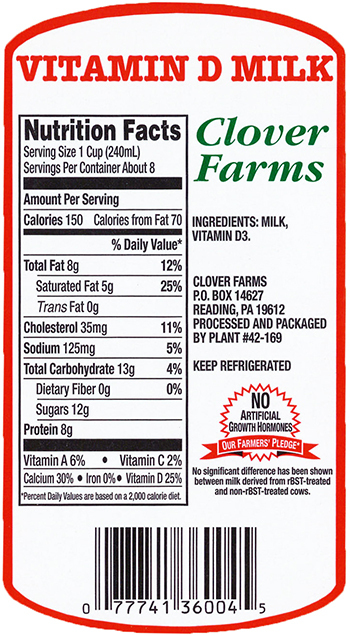 About Us: Clover Farms was established in 1937 in the rich, rolling hills of Pennsylvania Dutch dairy country. Our milk gets its unique great taste from our dedication to quality monitoring, careful processing, and attention to detail in packaging. For more than 80 years, we have maintained a tradition of quality, freshness and flavor in each refreshment that bears our name. Our 170 farm families work hard to provide the best milk available, enabling us to supply you with premium-quality dairy products. Try some today! Whether your kids drink milk by the gallon, or you just splash a bit on your oatmeal every morning, Clover Farms Vitamin D / Whole Milk is a great way to fit nutrition into your day.